Interview by Akemi Nagaya, a teacher with 10 years’ experience of teaching in London. How and when did Hello England start? 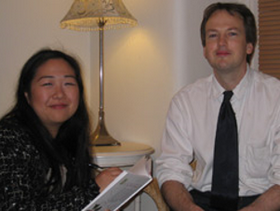 John Chisholm: I founded Hello England in June 2005 to offer English lessons to Japanese students in West London. In my experience, Japanese people are very enthusiastic about learning English, and benefit from learning from a native English-speaking who also understands Japanese, so I wanted to offer those sorts of lessons. Do all the Hello England teachers understand Japanese? All the teachers have some knowledge of Japanese culture and some experience of teaching Japanese students. The teacher is aware of the difficulties beginners may have with word order, plurals etc, and can also help the student to express themselves. However, a Hello England teacher will only use Japanese words occasionally. If the student hasn’t understood after the teacher has given an example, used gestures and drawn pictures, then the teacher may say ‘in Japanese, it’s ‘--- ’’, but the main point is to encourage the student to speak in natural English. What is special about Hello England lessons? The two objectives of Hello England lessons are (i) that the students develop a positive attitude to English and (ii) that the students learn to speak in natural English. In a one-to-one private lesson, the student has more chance to express himself or herself. In a classroom, the student doesn’t have so much opportunity to speak or give his or her own opinions. The Hello England teachers encourage the students to speak in sentences. Also, the teacher gets to know the student, so can help them in areas which the student finds difficult, as well as making spoken English relevant to that student. For example, instead of only reading textbook drills (‘Mr Smith plays tennis every Wednesday’), the teacher could ask about the student’s brother to encourage a more relevant example (‘Hiroki plays tennis with his friends every Wednesday’). The teacher will help the student use the English they have learned in relevant context, which helps the student understand and remember. How is learning English in London different to learning English in Japan? Compared to group lessons in Japan, children practise speaking more in Hello England lessons. In Japan, younger students often play lots of games like bingo and ‘fruit basket’, but don’t often speak in sentences. For example during a 50 minute lesson, they may have only said ‘hello’ and shouted ‘bingo’ and apple’, but I think it’s more beneficial for children to say ‘I like apples’ or ‘ ‘Apples are green’ or ‘I want an apple, please’. Once they become Junior High School students, there is more emphasis on grammar, but I think it’s very important to practice English word order and plurals so it becomes natural. Older students may learn about London, famous British people ( for example Queen Elizabeth, The Beatles, Florence Nightingale, etc) and events such as Christmas and Easter. Can Hello England teachers help students with school tests and Eiken tests? Yes, the teachers can help, but the students need to study by themselves too, as there is a lot of material in each level. Eiken Tests can be an incentive to study English and to show the students have learnt English to a certain level. However, as Eiken tests are multiple choice, there is sometimes a gap between passing a test and actually using the language at that level. A student may have passed Eiken level 3, but then forget basic grammar when speaking. For example, the teacher might ask ‘What did you do on Saturday?’, and the student answers ‘play game’ instead of ‘Iplayed games’. So it’s important to continue the speaking part of the lesson even when studying for these Eiken tests. Do you have any advice for students taking Eiken tests? (1) Learn all the vocabulary and grammar at one level before progressing to the next level. Sometimes, a student passes Eiken level 4, and the parents suggest they immediately start preparing for level 3. However, it is likely that the student hasn’t learnt how to use all the words and grammar at level 4 yet, but has simply recognized around 70% of the answers and passed. (2) The students should test themselves as they read the textbooks and vocabulary lists. They should read the books to learn, then go back and see if they remember a few days later. (3) The students should read the study books (教本) which explain new grammar and vocabulary first, before using the ‘previous test’ summary books (問題集). To me, it’s better to study first, then see how much you’ve remembered. Are the Hello England students all Japanese children? The majority of students are children, yes. Most are aged between 4 and 15, but some mums and dads have lessons too. Most of the lessons are at the students’ houses in Acton or Ealing, but some lessons happen in North and South London, with a few businessmen having lessons in the City after work. Is running Hello England enjoyable? Yes, most of the time! Occasionally there are stressful times when lots of students catch ‘flu and lessons need to be changed, but usually things run smoothly! The Hello England teachers are friendly and professional, and the students are eager to study, so usually the lessons are enjoyable and beneficial to the student’s progress in English. Of course I’m happy when the parents are appreciative of the teacher’s efforts to help educate their child. Also I teach some of the children’s lessons myself, and it’s great to see the children enjoy the lessons and use English. If everyone is happy and satisfied, then so am I!